If you want to save more money on your state and federal taxes, turn to Ewerth & Associates, C.P.A., P.C.. There are hundreds of tax loopholes available to U.S. taxpayers and we know how to identify which ones will bring you the highest tax savings. When you work with us, our team of tax professionals will provide the guidance you need to legally and effectively reduce your tax burden. Don't fight the government Work with the IRS, not against them. The best way to pay less tax is to leverage the tax laws put in place by the government to reduce your tax liabilities and beat them at their own game. It's not what you make, but how you make it. 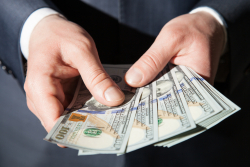 Tax laws favor people who make money through business and investments, not wages. Your earned salary is the highest taxed income there is. Stay on top of the changing tax laws. Tax laws are constantly changing, so count on a Certified Tax Coach to keep up with all current tax regulations and understand how they impact you. Don't wait! Act now to put your tax strategy in place. The sooner you put a Proactive Tax Strategy into action, the more opportunities you'll have to save money on this year's taxes. Meet your Tax Coach. Your Tax Coach will go over several questions about where you are now and where you want to be, in order to determine the best Proactive Tax Strategy program for you. Complete a Tax Questionnaire. Fill out a brief questionnaire that provides us with all the information we need to get started on your Proactive Tax Strategy. We ask for copies of your tax returns, information about your company, if applicable, and a few more questions relating to your finances and business, so that we can find the best solution for your unique situation. We design your Proactive Tax Strategy. We take about one to two weeks to research all the possible options and then schedule a meeting or phone call with you to go over your plan. You will then receive a write-up. After you have had time to digest the strategies, we'll follow up to answer any questions and help you put your plan into motion. Ready to start saving real money on your taxes? Call us today at 402-486-3777 to schedule your free consultation. 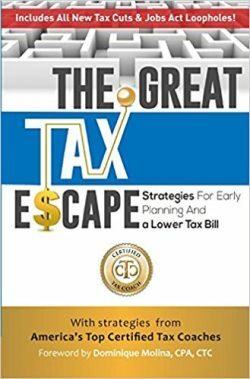 As a thank you for scheduling your consultation, we'll provide you with a book, The Great Tax Escape.